1 Paris: [thinking] Oooh, they're holding a memorial. I'll just lurk and hear what they thought of me in life. 2 Spanners: It's a shame that it had to come to this. I thought she'd be back annoying us any day now. 3 Iki Piki: I think we should build a statue of Paris. Made of plaster. 4 Serron: So is this the last time we have to go to her funeral? One was enough. 4 Paris: [thinking] Haunting's too good for this lot. Plaster of Paris is so named because of a large deposit of gypsum - the raw material from which plaster is made - at Montmartre, which is a hill within Paris. Plaster is made from gypsum by heating it to drive off the water within the crystal structure. When this is done, the lattice breaks down, forming the powder we know as dry plaster. When mixed with water, the chemical initially forms a paste-like slurry, but then slowly reabsorbs the water and reverts to a solid crystalline mass again. The world is an amazing place, no? 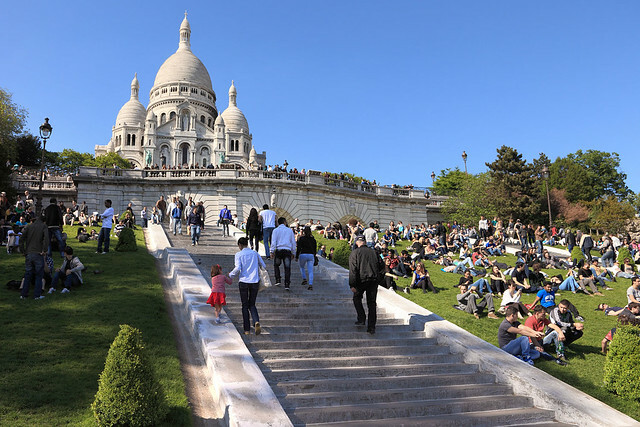 2015-06-03 Rerun commentary: Montmartre was one of those Bohemian neighbourhoods of Paris, where several famous artists set up studios, including Salvador Dalí, Edgar Degas, Henri Matisse, Amedeo Modigliani, Claude Monet, Piet Mondrian, Pablo Picasso, Camille Pissarro, Pierre-Auguste Renoir, and Vincent van Gogh. Presumably some of those worked in plaster as a medium at some point. At the top of the hill of Montmartre sits La Basilique de Sacré-Cœur, which looks a bit like it's made of plaster as it is pristinely white, but is actually constructed of travertine limestone. It's very impressive, and definitely a place to visit when in Paris. The surrounding streets are a bit touristy, but still fun. Last Modified: Wednesday, 3 June 2015; 03:11:10 PST.